SpecialtyUSA, LLC is a full service Special Event planner, Receptive Tour Operator and Business Development firm based in Center City Philadelphia. 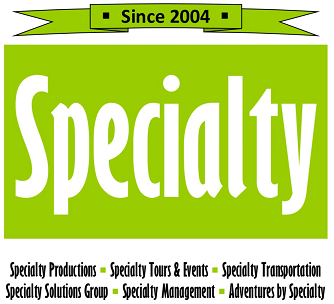 As one of the leading suppliers of sightseeing tours for conventions and incoming tour groups, our Specialty Tours & Events division handles arrangements for accommodations, transportation (buses, limousines, corporate cars), meals, sightseeing, evening entertainment and gifts. In addition to fully-customized itinerary planning, we offer more than 30 themed tour ideas and numerous exclusive licensed tour programs. , with a full-service special event production team, is your one-stop place for wedding coordination, special event development and execution, and fund raisers in the Specialty ProductionsPhiladelphia area. Our Specialty Solutions Group division handles consulting, sales & marketing and public relations for the hospitality and tourism industry.